THANKS SO MUCH FOR YOUR SUPPORT& FEEDBACKS! AMAZON reader reviews Super Body, Super Brain and titles it “This guy is awesome and his book is amazing and it does work”! I have been reading and doing fitness books and DVDs for at least the last 20 years (started in high school). I love science and I know that new discoveries are occurring everyday in the realm of what scientists know about the body, mind and exercise benefits. I love this book!!! I am a mother of 4 and have very little time. I was making time to work out for an hour a day (It was hard but…worth it). Then, I read this book. Everything in it is rock solid. The information is thorough but digestible. The tone is conversational and it flows well. He spends a lot of time in my opinion going into the studies and research. I found nothing to contradict what I have already read elsewhere through the years and on an ongoing basis. I just tried the “Super Body, Super Brain” and it wasn’t a crossword puzzle. It was a fitness program by New York City trainer Michael Gonzalez-Wallace that was actually worthwhile because it’s designed to make you think during a workout. Comments: Where can I learn more about this program besides the Oprah article. I tried the exercises in the magazine and loved it! Does Mr. Wallace have a book published? Comments: I hope you plan to release a book and/or DVD soon because I Think you’re onto something really innovative and life changing here! 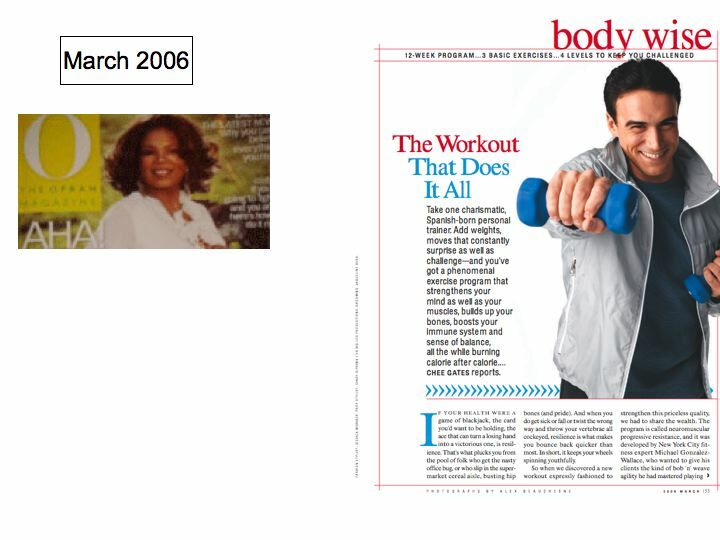 I am very impressed by the workout featured in Oprah’s magazine last month. It is perfect for those limited on time and space, yet it seems quite powerful. I am adding it to my current routine and I can feel it Working in places where I don’t usually get any results. I can’t even get through the entire 4 sets of the beginner versions yet, but I’m confident I will get there. I workout regularly (cardio and strength 5 times a week), yet I am 100 pounds overweight. I lost 200 pounds and managed to get to a healthy weight with intense strength training 15 Years ago but regained 100 pounds when I developed carpal tunnel Syndrome. Are there any special considerations for a morbidly obese? A person attempting this workout? Thanks again for sharing this amazing plan with the world. Comments: I did the 12 week set of exercises found in the Oprah issue & Now I’m wanting more! Can you tell me how to get another set of progression exercises? Thanks! Comments: I was wondering if you have a book or a Video out. I saw the article in Oprah and your site is interesting. How do you get all your exercise after the 3 you show? Comments: thank you, Michael!Yes, neuromuscular strength training really interests me. I’ve noticed in the past couple of years that I’m getting fewer results for the amount Of work I’m doing in my workouts (I’m 41 years old). I currently lift weights but I haven’t seen a dramatic improvement in my level of Fitness in a while.Keep up the great work and please keep me on your email list for any updates. Thank you for having Michael Wallace’s “”Super Body, Super Brain” ” last night. I’m VERY glad I participated. It was informative and a good opportunity to learn and perform different exercises (and burn lots of calories). Michael was very encouraging to all. It would be a nice addition to any workout routine— I would definitely include it and would gladly participate in an “Open Mic Encore” presentation. (His Oprah Magazine feature also could help bring in participants). Thanks again and for all your hard work with a great schedule. Comments: I attended the Mall of America presentation by Michael Gonzalez-Wallace. I have only been doing his first workout for 1 week every other day and can definitely tell you I was sweating within 20 minutes, but the most amazing thing to me was that I was so busy trying to keep coordinated and focus on my arms or legs and what they should be doing that at the end I realized I did 40 pushups with one leg raised and several other exercises that definitely challenged my muscle groups I felt great afterwards, ready to take on the day. I still need to master balancing and core exercises but can’t wait to move on to the second session. Thanks for keeping exercise fun for this grandma from White Bear Lake MN! time on Sunday. I am a seasoned exerciser that hates to do aerobics (I can’t stand all the jumping up and down) and I don’t belong to a gym, therefore, I do not have access to cardio equipment but of course I incorporate cardio into my program because it’s necessary. I was so pleasantly, pleased and amazed at how my heart rate soared; it gave me such a workout that I had to lay down for 15 minutes afterwards. The feeling was totally different from what I was used to with my other aerobic workouts. In my efforts to lose some weight, with sensible eating, the Owl and Hawk will become part of my workout regimen and I am going to do as you instructed: 3 times a week for 4 weeks then progress on to the Hawk and so on. Sweat,December 31, 2006By Stephen D. Gregory “ducky” (Toronto ON Canada) This program is deceptive. Just to watch it the exercises do not look difficult or strenuous. To actually do the exercises is challenging and i recommend this program to anyone who wishes to improve their coordination or balance as i do after a bad accident. I just wanted to let you know that I found your program and I tried out the owl level this morning. I quite enjoyed it. I did it with 5 pound weights. I found that the second side – I couldn’t keep up to the pacing – so I just did it a bit slower. It was fun! 1)It is outside in the park, and I love outside workouts. 2) It is functional fitness, and I am all about that at the moment. 4)I have quickly warmed to the instructor . 6) I have found level 1& 2 to be quite challenging, as my muscles were shaking after a while, I must conquer this program. 7) It challenges my endurance, balance and coordination, and has kind of a high rep feel to it ala slim series outside. I am a professional bridge player and incorporate Michaels exercises into my routine to concentrate before a competition. I have experience an improvement in my game since I have been adding The Brain Muscle Workout exercises. LEE KANTOR: Co-owner, Neighborhood Fitness; Broadcaster, Dr. Fitness and The Fat Guy Radio Show.. The guest list for the radio show is a virtual Who’s Who of the leaders in the health, wellness, fitness and weight loss industries including Jack LaLanne, Diane Schwarzbein, Tracey Mallett, Jennifer Nicole Lee, Jessica Denay, Michael Gonzalez-Wallace, FitSugar, Eating Well magazine, and hundreds of other experts. Lee is a co-author of a book entitled, You Can’t Lose Weight Alone: The Partner Power Weight Loss Program. Both my husband and I made the decision not to place him on any form of medication other than vitamins and the correct diet, we would search for an alternative solution. He has vastly improved in his co-ordination – in the beginning of the program he would be falling all over the place where as his movements are now more controlled and he manages to get the opposite arms working as Michael suggests in his program. 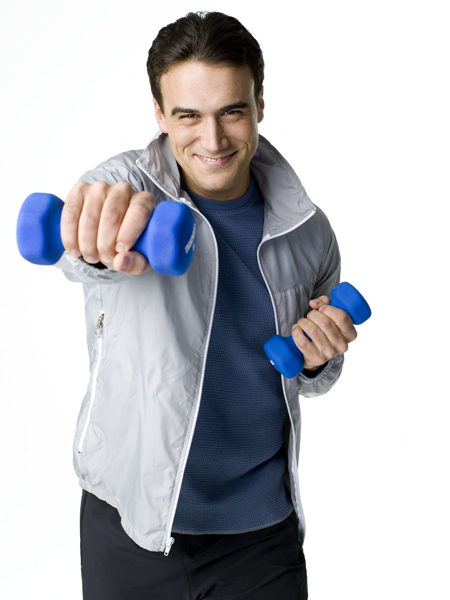 He has also improved in his multi tasking – he now performs the exercises without stopping when he talks to you. His school work has also improved, just the hand writing we have to work on now. Nathan has also showed an interest in sport (cricket) and this is due to him gaining more confidence as he can now hit the ball, so there has been an improvement in his hand eye co-ordination too. Nathan is now asking to go onto the second level of the program, which we will begin with next week. I have also been doing the exercises with him when I do not get home from work too late and I myself have found that I am less forgetful and I must say they look easy but you soon find out that you have muscles you forgot about and that your co-ordination is a little rusty. We have a good laugh though. 1.-Thanks for more of these wonderful examples of activating more integrated left-right brain function. 2.-Thanks for more of these wonderful examples of activating more integrated left-right brain function. these demos will be really valuable to the dyspraxic people with autism who I work with. Alicia, Washington (MS patient), For MS patients: Please don’t try this program without consulting with your doctor or with me, Thanks! I have been keeping up with the workouts and stretches. I did the new stretches you sent and was able to hold them all for a nice long stretch. The kicks and leg crosses were easier with the chair and I was able to do them just fine. My back hasn’t been hurting. It is funny with how MS works with me..some days I feel like I can do anything no problem and other days I get pains, feel exhausted, have a heavy head, muscle stiffness, etc. Since I have been doing your program I can honestly say I am having more better days than not. I want to improve my balance and get rid of my “clumsiness” in addition to strengthening my body. “Michael Gonzalez-Wallace has developed a remarkable workout and exercise system that easily combines aerobic and strength functions into an enjoyable experience. He has directed his marketing efforts toward children and school settings in an effort to help combat the growing health crisis among children. His success is spreading across America, has been featured in “O” Magazine, and is in use in many school districts in the country. I like doing the Brain Muscle Workouts with my mom and sisters. One of my favorite exercises in the program is the OWL. The more I have done the workouts the more energy I have. I think it has helped me to play better for my basketball team. I pay better attention when I am playing and get less tired running up and down the court. coordination. I might even join the school ski team next year. Since I have started using the Brain Muscle Workout I have seen a lot of self improvement. It has helped my endurance as well as my concentration levels. When I use it in the morning it helps me pay more attention in school. It also has helped me improve my basketball game and lacrosse skills. It has helped me a lot with my coordination and my balance. The steps are fun and easy to follow but it is an intense workout with great results. workout programs before but have never been able to stay with them. The exercises in Michael’s programs are engaging and make you think. My ability to focus on my work during the day has improved and I am not as tired at the end of the day when I get home. I have never enjoyed going to a health club to workout, it was hard to fit into my schedule. I have never been gifted with great balance or coordination so Michael’s Brain Muscle Workout Programs are perfect for me. It has helped me to improve my core body strength and balance. mental stimulus to the same program. Thanks Michael! playing on the computer. It is a struggle in our home as I am sure with many others. We now have set limits and include Michaels Brain Muscle Workout programs to our household routine. The results have been rewarding for all of us! We love this system and all of its benefits! Thanks Michael for coming up with a work-out we all can do. Comments: I met Michael Gonzalez-Wallace in January 2003, when he rescued me from an unreliable, unmotivated trainer at my gym. Previously athletic (I’m a Pilates instructor) I was overweight and very out of shape due to some emotional upheavals and rapid weight gain. Michael worked with me with patience, serious commitment to my goals and most of all he really got me moving. A unique program of fat – burning cardio combined with strength training helped me burn body fat fast combined with a conscious diet, my body improved rapidly and friends started asking me the “ the secret”. Everyone that I referred Michael to was charmed by his personality and ultimately pleased with their own results. Regrettably I encountered some more difficulties, which made me stop exercising, and self defeated my own progress for a few months. I am happy to say I am fully back on track and once again Michael is whipping me into shape. I truly believe that Michael has a unique capacity to bring each body he works with to its absolute best potential. I feel lucky to be working with him and to have witnessed the development of his program Neuromuscular progressive Strength Training (NMPST). His program is fun, challenging and has aided me not only physically but mentally as well. It helps me tremendously with my periodic battles with depression and anxiety, enhances my stability and focus on daily activities. This is truly my program for life. I met Indran Purushothaman, a 42-year-old management consultant, when I worked as a trainer at New York Sports Club. He had a slip disc back injury—which happens when the discs that act as cushions between the vertebrae become dislodged, causing friction in the bone. The catalyst: A collective of hours sitting hunched and crouched in front of his laptop and playing field hockey almost every Sunday since age 9. The slipped disc was pinching a nerve, and pains were shooting down to his ankle on his left side, so much that he couldn’t play anymore—a devastating blow. He tried physical therapy for a while, but it offered no relief. The suffering persisted, limiting his range of motion, interrupting his life. Doctors suggested he retire gracefully from the game. But he wouldn’t bow out without a fight. So, I started training him 3 times a week. Indran required a specific plan of action. First, he needed to build a sturdy core, which would help strengthen and straighten his spine. Dropping about 10 pounds would lighten the strain on his back. We had to work the muscles surrounding the core, since they’d been strained from the injury. “My favorite exercise is the reverse push-up,” he says, a move that’s performed going down the stairs, headfirst—slowly. Within six months, after being out of the game for almost 2 years, the pain subsided and Indran was back on the hockey field, operating at about 95 percent. A year later, he revisited one of the physical therapists he’d seen before starting my program for an MRI. And there the formerly slipped disc was pictured in black and white, comfortably tucked into its proper position. Indran’s relief wasn’t just psychological; there was an actual skeletal shift. Brain workouts focused on memory are big business. Memory is located in only one part of the brain. It is movement that connects the intricate web of brain circuitry since different kinds of movement are managed by different areas of the brain. These critical brain circuits work with your muscles, tendons, and joints to dictate the quality of movement throughout the body. 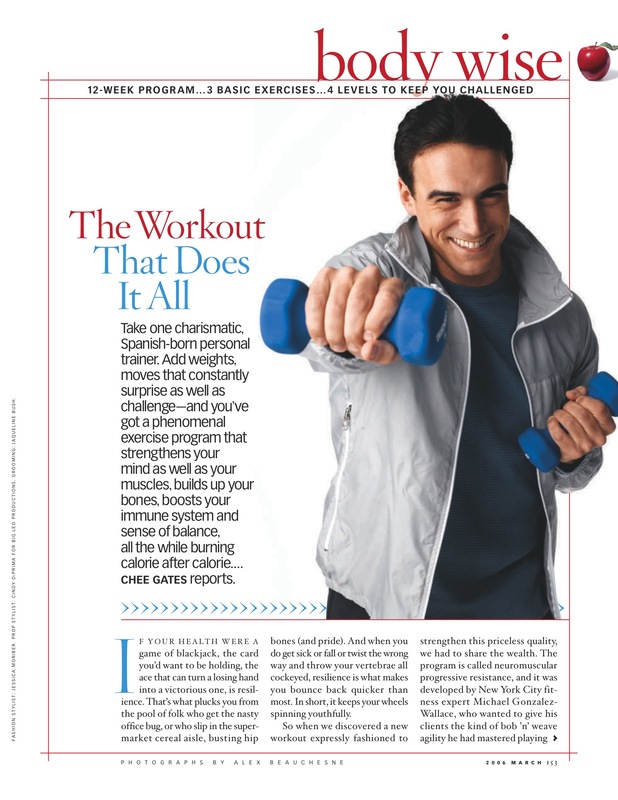 In “Super Body, Super Brain”, author Michael Gonzalez-Wallace combines specific movements, involving balance and coordination, creating an atmosphere of multi-tasking connecting the brain circuitry and providing the brain with a workout from front to back and left to right. These movements are combined into a powerful, full-body workout that keeps both your body and brain fit. The program only takes ten minutes per day and delivers maximum results in minimal time creating the ultimate in body and brain efficiency. The workout progresses in difficulty over time as both muscles and brain circuits need challenges in order to stay fit. The program can be done anywhere, by anyone regardless of their shape or level of athletic ability. The book will also include a nutrition progam with recommended ‘power brain foods’ and easy-to-follow recipes.